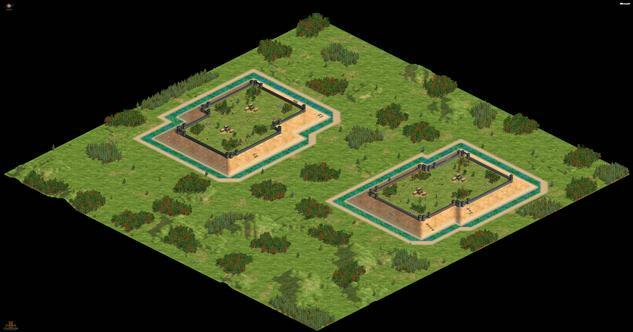 Hill Fort is an interesting map and will remind a lot of Age of Mythology players of the map Acropolis. The main difference between these maps is when Hill Fort is played in team mode, you’re entire team will have their individual plateaus. The way the hill setup works you will be forced to fight together as a team, win together as a team; or be defeated as a team! Before continuing it is worth noting that on entry to map there is a 50-50 chance you will all have either stone walls, or palisade walls. This can drastically change the style of game you should be playing! 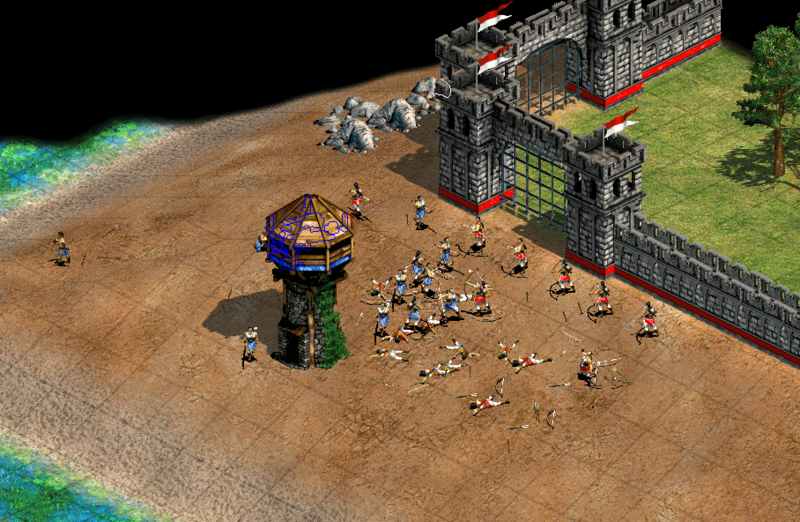 Fortress type map, players start on a hill together with their teammates. Can you take over your opponent’s hill or will they make it impenetrable? You have a few options with this map style that work out very successfully. The first option is to use the maps starting fortress to your advantage complimenting that with the hill bonus. Wait for your opponent to come to you and deal with your enemy’s army at your doorstep. Once you’ve dispatched your opponent’s initial attack, push back out to them. The down side to this strategy is there are only limited resources on top of your plateau and eventually you’ll need to push out or risk your empire starving for resources. The other side of that coin is to get aggressive and push out as soon as possible, restrict your opponent’s resources and trap them on top of their hill. Keep playing aggressive but don’t over commit and attempt to rush the hill. You can then use this time to further your own economy while not allowing your opponents villagers to fan out and increase their income. Playing this way the longer the match goes the higher the odds fall into your favor. Your empire thrives and your opponent’s restricted resources cause them to slowly fall behind. On Hill Fort you still receive you’re standard starting two boar plus 8 cows. 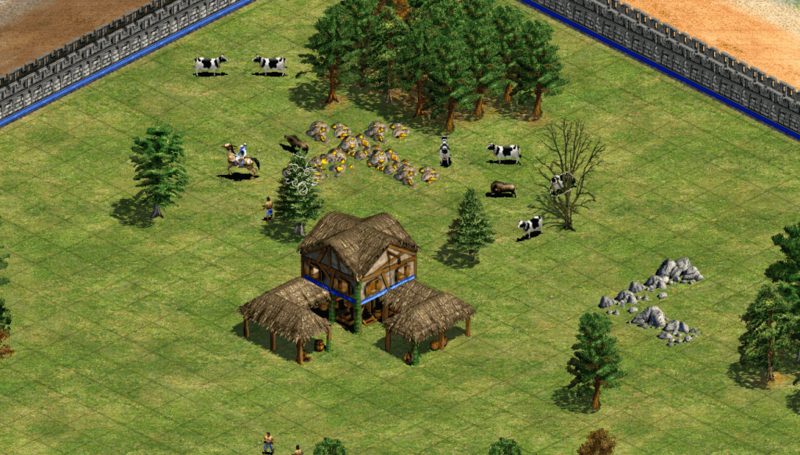 Remembering cows are worth 150 food instead of the standard 100 from sheep means you will be able to push up to Feudal Age a little bit earlier whilst also spending less resources on getting farms down early. To top off the food you’ll even get a deer patch as well! Due to the starting palisade/walls it’s super easy to lure them to your Towncenter for an even quicker boost. Delay your farms as long as you can and invest in either pushing out in early Feudal Age or go for that quicker Castle Age. The downside to all this readily available food is you will not receive any berry bushes, be careful to keep your food count up and not forget to factor in villager production. Inside your palisades you’ll also receive one gold pile that occupies 7 tiles and a stone pile which occupies five tiles. Any extra resources you need will be down the hill in dangerous territory. Each player will receive a gold and stone pile on their hill section, each consisting of four tiles. You can still defend these extra resources with the hill bonus however, should your opponent cut you off and confine you inside the palisades you’ll have issues keeping your resource income up as the game goes on. Despite being quite close to Arena, this map presents a lot of different challenges. Hopefully with the above information has covered you from how to get aggressive to identifying your map and reading it correctly. We now send you out into the world of Hill Fort ready to conquer your enemy. Go climb that hill! How do you like to play this map, got something we haven’t thought of that keeps you winning? Let us know your special build and ideas below so we can get past scratching the surface and take it to a whole new level!